One of the tropes of the antivaccination crusade is that mercury in vaccines cause autism. Of course, this myth of the vaccine deniers is based on several assumptions, all of which are more or less facetious, if not outright fabrications. For example, few vaccines actually contain mercury in the form of thiomersal, and the few that have it (typically, the flu vaccine), have single dose injections that don’t contain it. Furthermore, there is no evidence that thiomersal causes autism. And there is no evidence that children with autism spectrum disorder (ASD) have higher blood or urine levels of mercury. 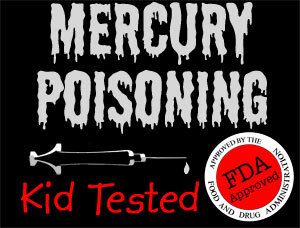 Of course, mercury can cause numerous neurological deficits, but that’s almost always from the methylmercury form, not the ethyl-mercury form (including thiomersal), and certainly not in the tiny quantities delivered in a vaccine. In a new, and very extensive, study examining the link between environmental mercury, which is usually found in the methylmercury form, and ASD, the results appear to rule out any connection between the two. Basically, the research showed no correlation between high levels consumption of fish, which bioaccumulate methyl mercury, during pregnancy and ASD diagnoses in children. Presumably, if methyl-mercury had a neurological effect on the developing fetus, mothers who consumed a lot of it would have put their children at risk of ASD, if we go with the hypothesis that mercury causes autism. The study was based on more than 30 years of research in the Republic of Seychelles, a 115-island country spanning an archipelago in the Indian Ocean, some 1,500 km (932 mi) east of mainland Africa. Women, across the world, have always been warned to stay away from fish while they are trying to get pregnant and when they actually are pregnant because fish contains high levels of methylmercury, which was thought to be the cause of autism and other neurological deficits. These researchers observed 1,784 children, adolescents, young adults, and their mothers, first by determining prenatal mercury exposure by hair samples collected from the mothers around the time they gave birth. They then had the offspring fill out two different social communication questionnaires in order to determine if they were exhibiting any autism-like behavior, a screening tool frequently used in the USA to measure language skills, social communications, an repetitive behavior. These tests are some of the best methodologies to determine if further evaluation for ASD is necessary. The mean prenatal methylmercury exposure for all subjects in the analysis was 8.4 ppm (standard deviation [SD] = 5.7), which was about 1 ppm lower than methylmercury exposure in mothers with children who exhibited ASD symptoms. However, this difference was not statistically significant. The most recent cohort of subjects (from 2001) showed that methylmercury exposure, where the actual nutritional consumption was measured, showed prenatal methylmercury exposure to be approximately 5.7 ppm, while the ASD mother’s group had a methylmercury exposure of 4.9 ppm (lower than the control group, but still statistically insignificant). The study itself was very well designed. They were able to accurately measure the women’s prenatal methylmercury levels, and they showed that the levels were approximately 10 times higher than that of mothers in the USA, where several public service announcements continually warn against eating fish during pregnancy. Furthermore, the cohort size was fairly large, which helps identify statistical trends. Lastly, they considered several covariables that might have provided some correlation of other causes with ASD (none were found). In conclusion, we found no association between prenatal methylmercury exposure and phenotypic ASD behaviors. Our findings contribute to the growing literature suggesting that exposure to organic forms of mercury does not play an important role in the development of ASD phenotypic behavior. According to the Centers for Disease Control and Prevention, an estimated one in 88 American children, born in 2000, are currently diagnosed to be on the autism spectrum, which is 2X higher than it was in the previous decade. Despite this increase (which could be as a result of earlier and better diagnoses, but also could be an actual rise in the rate of ASD), science has not found a definitive cause for autism. Of course, It was once believed that vaccinations caused autism in children. Of course, Yes, Mr. Andy Wakefield, who penned the fraudulent paper alleging a connection between MMR vaccines and autism, and later retracted by the Lancet, caused almost all of the “vaccines cause autism” which mutated to the “mercury causes autism” meme. Well, based on this study, mercury doesn’t cause autism. And pregnant mothers eating fish with methylmercury also doesn’t cause autism. We can add that to our knowledge that vaccines don’t cause autism. Aschner M, Ceccatelli S. Are neuropathological conditions relevant to ethylmercury exposure? Neurotox Res. 2010 Jul;18(1):59-68. doi: 10.1007/s12640-009-9113-2. Epub 2009 Sep 16. Review. PubMed PMID: 19756911. Impact factor: 2.865.